Sangin in Afghanistan is the most dangerous place in the world for UK troops, with six UK servicemen being killed there since the beginning of this month. Newsnight's Mark Urban travelled to Sangin to report on what is happening on the ground and why it is proving so lethal for UK troops. Among British soldiers in Afghanistan, Sangin has the grimmest reputation. 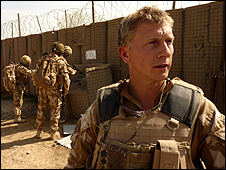 Half of all UK forces casualties occur in this one area of operations, with about one tenth of Britain's forces in Afghanistan deployed in it. 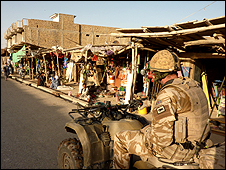 When the 2nd Battalion of the Rifles finished its tour in Sangin in the late summer of 2009, soldiers spoke about their six-month stint as an epic of hard fighting. It had certainly been a difficult time, with 22 soldiers killed and dozens seriously wounded. And while the attention has been on central Helmand and Operation Moshtarak, the losses incurred by the 3 Rifles Battlegroup, the battalion that took over in Sangin last October, have climbed to 27 killed, with around one month of their tour still to serve. Eight Afghan National Army soldiers have also lost their lives there during the same five month period. Yet all of the key players you meet there, from the British military commanders to the Afghan district governor talk about great progress. "We've made a very conscious effort to keep going in the face of that, and it's not blind optimism or anything like that or throwing more cannon fodder forward. "These are very carefully considered operations and the casualty figures just don't reflect the progress we've achieved." [at that time] nobody could come here to attend any meetings because it was too dangerous, no-one alone could go out to the bazaar, you had to go to bazaar in a group of five or six, now the total control of the bazaar is in our hands." People who know Sangin agree that things have got much better in the past year. There are now three times as many shops trading in the bazaar, and 41 primary schools and one high school have opened. The "ink spot" of security around the district centre has grown too. By establishing a denser network of security posts around the bazaar and government offices, the 3 Rifles battlegroup has brought relative calm to an area around those central landmarks. People who served with the last battlegroup have told me that IEDs used to be laid as close as 10 metres (yards) from their camp gates, and gun battles often started as soon as they left them. However, the growth of this "safer" area can be measured in the hundreds of metres rather than kilometres, and it cannot be said that soldiers are completely safe from attack in these areas even now. A couple of this past week's fatalities have happened within the inner group of patrol bases that surround the district centre. Why then does the casualty rate remain so alarmingly high? To start with Sangin has long been considered to harbour an unpleasant combination of tribal, criminal, and extremist elements. Appoint a mayor from one tribe and you will inevitably incur the displeasure of another. Local politics are a Gordian Knot of violent rivalries. In recent months, Lt Col Kitson and his people have been using different tactics. These are the "population centric" ideas espoused for the past year by the Nato commander, US General Stanley McChrystal. In order to win people over, members of the 3 Rifles battlegroup have been inculcated with ideas of 'heroic restraint' - refraining from returning fire or using heavy weapons under certain circumstances. Gen McChrystal has always been candid that 'heroic restraint' involves patrolling soldiers accepting greater risk. In Sangin you hear differing views about this doctrine and whether it is contributing to high casualties. Some of the troops I met at Patrol Base Blenheim, on the violent fringes of north-east Sangin, and scene of almost daily firefights, were pretty frank about their intention to shoot insurgents as soon as they had positively identified them as being armed and presenting a threat. They considered ideas like firing warning shots in such circumstances to be nonsense. Elsewhere, many people were more on-message. There can be little doubt though, that in getting "closer to the people" through the establishment of increased numbers of patrol bases and more patrolling by foot, the 3 Rifles battlegroup has embraced greater risk. The fact that most of the recent British fatalities have been killed by gunshots rather than IEDs can be seen as evidence of these new realities - it is harder for the Taliban to place bombs inside the coalition's larger security bubble, while patrolling these areas exposes the soldiers to gunfire. The sense that the new tactics have shifted the shape of the struggle into a contest for the support of the district's people extends more broadly too. The Taliban Civil Commission, the Taliban's unofficial government in Sangin, has agreed that schools should re-open and apparently feels it is not in the movement's interest to attack the reinvigorated bazaar. The Taliban too then, perceives that it must not wreck the possibilities for greater education and business. So where does this leave the struggle in the months ahead? 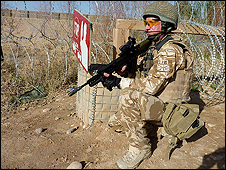 Just securing an area of several square kilometres currently consumes around 1,500 British and Afghan troops. Extending it could require hundreds if not thousands more. Yet Britain, paying the fearful price for a slow improvement in the district, would have to think hard before sending any more troops there. The answer seems to lie in the re-drawing of boundaries currently being considered by senior Nato commanders. The Americans will take over from the British in some places - and this could free up some troops. They may also chose to place the British battalion in Sangin under a US brigade, which would bring US marines to secure some parts of the district. One thing is clear - that those running Nato's operation think that what they are doing is working in Sangin and that they want more of the same. Watch Mark Urban's full report from Sangin on Newsnight on Monday 8 March at 10.30pm on BBC Two, then afterwards on the BBC iPlayer and Newsnight website.